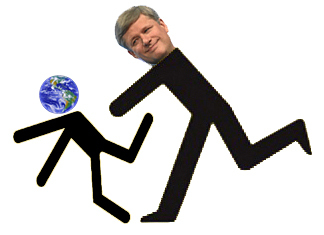 OTTAWA -- Sierra Club Canada is warning president Obama not to take Prime Minister Harper's new climate change offer seriously. Stop plans to build small nuclear reactors in Saskatchewan to power oil extraction from the Alberta Tar Sands. The Saskatchewan government and nuclear industry – with public and corporate money “laundered” through the University of Saskatchewan (U of S) – plan to build a small nuclear reactor to power extraction of oil from the Alberta Tar Sands. When elected in 2007, Saskatchewan Premier Brad Wall (his Saskatchewan Party is ideologically tied to Harper’s federal Conservatives) created the Uranium Development Partnership (UDP), chaired by one of the U of S vice-presidents. With industry support from Bruce Power (nuclear reactors) and its majority shareholders, Cameco (uranium mining) and TransCanada Corporation (the Keystone pipeline), the UDP pushed to establish a nuclear program at the University. university consortium have used the U of S to bypass this overwhelming expression of public opinion. The Canadian Centre for Nuclear Innovation (CCNI) was announced in March 2011 with $30 million of Government funding over 7 years. Its first goal is to build a prototype small nuclear reactor on campus. In August 2011 the Government and Hitachi-GE Nuclear Energy Ltd announced another $10 million towards that objective. Current U of S President MacKinnon and Board of Governors Chair Nancy Hopkins have been deeply involved in this project. Hopkins owns nearly $2 million in Cameco investments and is a paid Cameco director ($175,872 in 2009). MacKinnon accepted an all-expenses-paid trip to Cameco’s northern operations and exclusive lodge in 2009, at the peak of the public debate about the UDP report. But MacKinnon retires from the U of S on June 30. We must send a clear message to his successor, Ilene Busch-Vishniac, to step off this destructive path. Brad Wall’s government has starved the University of essential funding – U of S has an accumulated $90 million debt. Existing infrastructure is crumbling. New buildings on campus can’t open. And the $40 million for the CCNI and related nuclear projects won’t help U of S out of this crisis. The University of Saskatchewan, founded in 1907, was once proudly called “the people’s university” – set in the heartland of the Canadian cooperative movement, home to Tommy Douglas, the greatest Canadian, the father of Medicare. Today the University has become an easy target for corporate takeover and a tool for the nuclear and petroleum industries. But right now we have a chance to stop this from happening. The energy onslaught has opened up on all three coasts. As Canadians we understand the need to protect wild spaces and the creatures that reside within them. The United States is considering opening the Arctic National Wildlife Refuge to oil and gas development. Canadians, and particularly Prime Minister Stephen Harper, must ensure that Americans are aware that we implore them to permanently protect the Refuge, and not allow oil and gas interests to make them blind to its beauty and importance to native culture. The Porcupine caribou herd is a herd of 130,000 barren ground caribou. The herd derives its unusual name from its twice annual crossing of the Porcupine River during its fall and spring migrations. The herd's annual migration from its winter range in the boreal forest of Alaska, the Yukon and the Northwest Territories to the coastal plain of the Arctic National Wildlife Refuge is the largest migration of any land animal on earth. The coastal plain of the Arctic Refuge is the core calving area for the herd. It is the place where pregnant females give birth to 40,000 calves each June. For many reasons, wildlife biologists call this place a "critical habitat" for the herd. For the Gwich'in of the Arctic it is simpler than that: the calving grounds are a sacred place. The Gwich'in are caribou people. They have lived in the north and depended on the caribou for more than 20,000 years. Caribou are at the very heart of Gwich'in culture. As Gwich'in activist and Caribou Commons Project speaker Norma Kassi says, "The relationship between the Gwich'in and the caribou is not one of convenience; it is one of necessity. A healthy Porcupine caribou herd is necessary for the continued survival of Gwich'in culture"
The issue of oil and gas development in the calving grounds of the Porcupine caribou herd is one of the most important conservation issues in the world today. For the Gwich'in, it is a human rights issue that goes to the very heart of their culture. For humanity, it is a matter of protecting an ancient way of life and a pristine ecosystem ­ America’s last great wilderness. 1. Hold a screening of the documentary Being Caribou. 3. Do you know any Americans? Are you a dual citizen? Check out the www.ArcticRefugeAction.org to find out how to write senators and representatives, urging them to defeat a budget bill that would allow arctic drilling. Using their online tool, write a Letter to the Editor as an American, or dual citizen, or concerned Canadian!